Our freeze dried shredded mozzarella cheese is a versatile product that you will want to include in your food storage needs. This cheese is great to use for any recipe that calls for mozzarella cheese. So for those that love Italian dishes this is a need. This cheese is easy to reconstitute. This can be used for sauces, casseroles, and as a great healthy snack right out of the can. This is a need for your long term storage needs. Ingredients: Part-skim milk, cheese cultures, salt, enzymes. Microcrystalline cellulose added to prevent caking. Non GMO. Naturally gluten free product. Freeze dried mozzarella cheese is a versatile cheese that is used in most Italian dishes. Pile it on your favorite kind of homemade pizza. Layer your lasagna with this cheese. This can be used to make healthy snacks. It can be eaten straight out of the can. Directions: Cover 1 ½ tbs. of shredded cheese with 1/8 cup warm water. Let stand 10 minutes and drain off excess liquid. 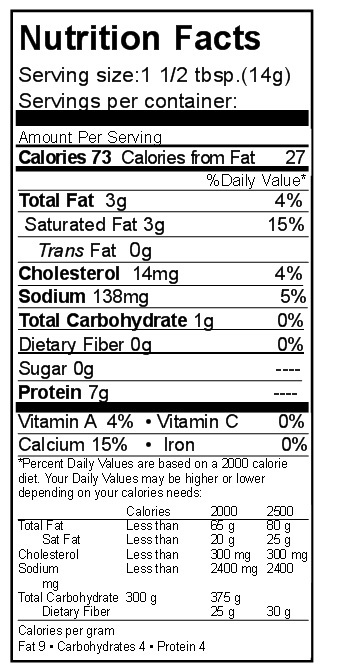 Yield: 1 ½ tbs. (1 oz.) cheese. Use in casseroles, pizza, soups, chili, salads.